Another World, Another Time ... In the Age of Wonder. In another time, The Dark Crystal - a source of Balance and Truth in the Universe - was shattered, dividing the world into two factions: the wicked Skeksis and the peaceful Mystics. Now, as the convergence of the three suns approaches, the Crystal must be healed, or darkness will reign forevermore! It's up to Jen - the last of his race - to fulfill the prophecy that a Gelfling will return the missing shard to the Crystal and destroy the Skeksis' evil Empire. But will young Jen's courage be any match for the unknown dangers that await him? Given that this new “Collector’s Edition” of 1982’s The Dark Crystal marks its third release on DVD – and my third review of the flick – I figure I should skip my usual blather about the movie. If you’re interested in my full opinion of the fantasy tale, please consult my examination of the most recent version, the 2003 Superbit release. Ultimately, The Dark Crystal stands as a wonderful technical achievement, but the film itself lacks spirit and heart. It's clear that the filmmakers worked very hard to create a different world, and they succeeded in doing so. However, they seemed so concerned with the techniques that they neglected to offer any story or characters who substantially involved the audience. It's a film that broadens the horizons of what can be done with puppets, but instead of worrying about what they should do with the story, the filmmakers were more concerned with what they could do and the resulting movie suffered for that. 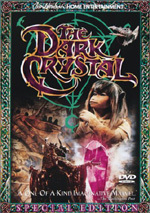 The Dark Crystal appears in an aspect ratio of approximately 2.35:1 on this single-sided, double-layered DVD; the image has been enhanced for 16X9 televisions. 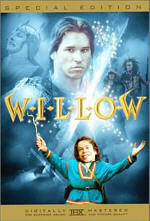 Since this disc offered the third DVD release of Crystal, one might hope for a new transfer. Unfortunately, it provided the same one first seen in 1999, with all the same pros and cons. Much of Crystal looked absolutely gorgeous, but some nagging flaws forced me to lower my grade. Sharpness seemed excellent. The movie always came across as nicely well defined and accurate. At no time did I discern any issues related to softness, as the flick stayed crisp and distinct. Jagged edges and moiré effects also created no concerns, and I detected no signs of edge enhancement. Due to the production design, Crystal offered a fairly subdued palette that tended toward an “earthy” look. Within that spectrum, the tones looked very accurate and lifelike, and when the hues brightened, they really came to life. For example, the scenes in the Skeksis palace demonstrated many gorgeous colors; check out their purple robes to see what I mean. Black levels consistently came across as wonderfully deep and rich, while shadow detail looked appropriately dense but never overly thick. Based on all these elements, Crystal should have earned an “A” and could even have approached “A+” territory; the majority of the image truly looked amazing. It lost points due to the prevalence of print flaws. The picture occasionally seemed grainier than I’d expect, and it displayed a significant number of specks and bits of grit. These didn’t seem overwhelming, and many of them resulted from the processes used. An effects-intensive flick, Crystal featured more than a few composite shots, and those images tend to suffer from more source defects than usual. However, specks and grit showed up even during scenes with no such work. The quality of the print never became atrocious, but it remained moderately problematic. The loveliness of every other element meant that I felt The Dark Crystal still merited a “B+”, but with a little cleaning, this image could have earned a substantially higher mark. Unfortunately, the audio on this disc didn't come close to competing with the often spectacular image. The Dolby Digital 5.1 soundtrack favored the forward soundfield, and that domain offered a pretty wide spectrum of sound. The audio spread nicely across the front speakers, though it didn’t blend together terribly well. Elements tended to favor a “speaker-specific” formation and they rarely meshed with each other to any convincing degree. Nonetheless, the soundscape seemed nicely broad, and it opened up matters fairly well. Surround usage appeared limited. For the most part, the rear speakers simply reinforced forward elements. That meant mostly music from the surrounds, though some effects – such as the chant of the Mystics – also cropped up back there. Nonetheless, this remained a very forward-oriented track. While the properties of the soundfield seemed more than acceptable for a movie from 1982, the audio quality came across as less positive. Overall, the tracks appeared somewhat thin and shrill. Speech sounded hollow and moderately edgy at times. I never found it difficult to understand what was said, but the dialogue nonetheless came across as a bit rough. Effects followed suit. They generally seemed flat and without much distinction. They displayed a little distortion at times but usually appeared reasonably clear. Music was similarly bland, as the score lacked much life. It didn’t display any significant flaws other than the absence of pizzazz, though; the music simply came across as dull. Some light and boomy bass appeared at times, but not to any significant degree. The soundfield of The Dark Crystal seemed vivid enough to earn the audio a “C+”, but the very spotty quality of the audio caused concerns. For the most part, this “Collector’s Edition” release of The Dark Crystal just replicated the supplements found on the original 1999 DVD. However, it added some new materials, which I’ll connote with an asterisk. First up is a very good 57-minute and 21-second documentary about the film called The World of The Dark Crystal. This piece was created at about the same time as the film itself. It consists of a nice balance of interviews with all the key creators and some wonderful footage shot on the set of the film. The latter really is fun, since it gives us a firsthand look at just how Henson and company worked their magic. The documentary talks a little about the origins and inspirations for the project, but the nuts and bolts are the focus, which seems appropriate. Many times I don't care for documentaries that are from the same time period as the films themselves - they usually lack historical perspective - but this one works well. The DVD also includes deleted funeral scenes. These come from a section early in the film when both the leaders of the Skeksis and the Mystics die. They're actually fairly powerful scenes, so I'm not sure why they were omitted; the filmmakers probably thought they didn't move along the story, but that's just my guess. Since they come from a workprint, the quality of the clip isn't great, but it's still an interesting piece of footage. More curious are seven scenes that appear in the finished film. They are offered in the supplemental section in their workprint form and they have the original language on them. To be frank, I'm not completely clear what this is supposed to mean. Sometimes we hear bits where the Skekses usually speak a language other than English, and when we see Aughra, Frank Oz performs her voice, just as he did on the set. (Oz did the physical puppeteering for the character, but someone else gives her voice during the released film.) However, some of the voices seem to be the dubbed ones we hear on the finished print. My guess is that the workprint offers the voices the way the filmmakers originally intended them to be when the film went into release but that they changed them after the workprint was completed. I figure that they decided to make the Skekses speak English because there were too many subtitles, and they lost Oz's performance because it sounded too much like Yoda (the character of Aughra shares some similarities with that Jedi master as well, so it probably came across as too much of a rip-off). These are just my theories, so if anyone knows the facts, I'd love to hear them. We get a few more supplements as well. One section displays drawings of the Mystic and Skeksis characters and offers very short biographies of them. This part's interesting because it shows these characters do have names, despite the fact we never hear them in the film. 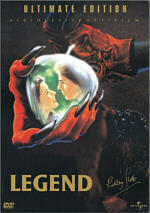 The talent file provides very basic biographies of co-directors Henson and Oz and conceptual designer Brian Froud. These are pretty lame, since they offer almost no information. After this we locate *The Mithra Treatment. This text component presents Jim Henson’s early coverage of the story, its characters and its settings. Some of this remains the same as in the film, but much of it comes across as different. Fans should enjoy this glimpse of the tale’s origins. *Character Illustrations offers exactly what the title implies. It gives us a small still gallery with 10 drawings of various Crystal participants. *Storyboards presents a short depiction of an attack sequence. It uses 11 frames to show its art. Next we find a few trailers. Two full-length Crystal trailers are here – one American, the other European - as well as a "teaser" clip for the film. In addition, a trailer for Labyrinth is included. Lastly, a mix of non-disc-based extras appear in this “Collector’s Edition”. First up is a *special introduction from Jim Henson’s daughter Cheryl. She tells us a little about her dad’s processes and indicates the origins of the project. That leads us to the *replication of Jim Henson’s notepad. This neat little piece shows Henson’s handwritten notes about Crystal and offers some unique insight into his mind. Finally, the package includes a *senitype. This presents a frame from the film with some text written on a card. I’ve never really understood the appeal of this sort of piece, but it’s there if you like it. To look at my recommendation, we’ll have to compare the three DVD editions of Dark Crystal. All three present virtually identical picture and sound quality. The Superbit release might tighten up the visuals slightly, but it still suffers from all the print defects that mar this disc and the 1999 version. The audio sounds the same for all three, with all those various highs and lows. This means that recommendations relate to the supplements. If extras don’t matter to you at all, then the Superbit remains the way to go. For those who enjoy bonus materials, the question becomes which of the other two releases provides the most compelling package. Whereas CTS’s “Collector’s Edition” of Monty Python and the Holy Grail exactly replicated that film’s prior two-DVD special edition, the Dark Crystal CE alters the disc-based extras in a few ways. I’ve already noted this package’s additions, both on the DVD itself as well as in the box. Bizarrely, the CE drops some components from the 1999 DVD. Two omissions seem insubstantial: we lose a trailer for Jim Henson’s Storytellers and some basic production notes in the booklet. More bothersome is the removal of Trevor Jones’ isolated score. That appeared on the 1999 disc but doesn’t show up here. With a list price of almost $50, the CE shouldn’t lose any extras. Really, I can’t imagine that any folks other than the biggest Dark Crystal fanatic would want to shell out the bucks for this “Collector’s Edition”. For what it is, it provides a nice set. However, it doesn’t expand much on the previously released version, and it comes with a much higher price tag. 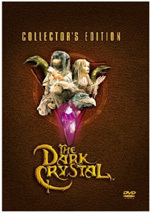 If you simply adore The Dark Crystal, then you might want to snare this “Collector’s Edition”. Otherwise, stick with the much cheaper package, as it seems almost as satisfying.